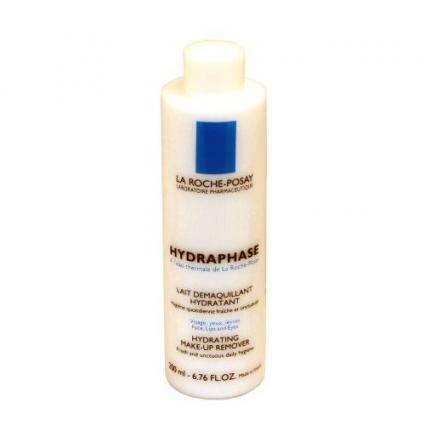 If you suffer from dry facial skin, you may want to give La Roche Posay Hydraphase Hydrating Cleansing Milk a try. This rich cleanser is chock-full of pampering, nourishing ingredients that promise to make a difference in your skin's condition. Named for a village in central France, La Roche Posay is known for using thermal spring water in all of its products. Rich in selenium, this natural ingredient is a powerful antioxidant, soothing treatment and skin protectant all in one. The company's products are ideal for all types of skin, even the most sensitive, and are hypoallergenic and non-comedogenic. No matter what your skin type might be, La Roche Posay has a regimen made specifically for it. Whether you deal with regular bouts of acne and battle a shiny t-zone daily, suffer uncomfortable itchiness and tightness or are blessed with normal skin, you can pick and choose from a number of appropriate products. The lineup includes cleansers, toners, moisturizers and protectants. If you suffer from dry skin, you're familiar with the aggravating discomfort that accompanies it when you wash your face at the end of a long day. You may experience tightness, itchiness, redness or general allover irritation. This dehydration occurs when the skin's barrier deteriorates in some way, either due to hormonal, chemical or climactic changes. When the skin reacts to any of these factors, it may crack, allowing irritating external elements to penetrate the barrier. The end result is dryness. Alleviating the dryness can be a challenge, and treating it may require more than just a smart skincare regimen. If you deal with extreme discomfort, you may wish to visit your dermatologist to rule out any type of atopic dermatitis. Increasing your water intake, reducing stress levels and avoiding scented products are just a few of the other habits you'll want to adopt if you're battling dryness. In addition, your skincare regimen should start with a facial cleanser that effectively removes makeup, dirt, oil and impurities while imparting moisture. Dry skin types particularly benefit from thick, luxurious formulas that are milky or creamy. The La Roche Posay Hydraphase Hydrating Cleansing Milk meets these criteria to the letter, and offers comfort to flaky, dehydrated skin. La Roche Posay recommends this cleanser specifically for normal to dry skin, as well as for anyone who suffers from tight skin or seasonal dryness. During the winter, cold air wreaks havoc on the skin, stripping it of necessary moisture. The result is the sudden dryness and discomfort you may feel. Step up the moisture in your skincare routine and you'll probably experience a shift in the right direction, even if it's just a minute change. In addition to removing impurities, this cleansing milk is formulated to remove even the most stubborn makeup (that means you, waterproof mascara and indelible foundation). Simply smooth it on with your fingers, allow it to sink in for a moment and finish by rubbing it off gently with a cotton pad. La Roche Posay states that it's not necessary to rinse following removal, but if you'd prefer to rinse the cleanser off with water instead of wiping your face dry, that is certainly acceptable. In order to keep your skin comfortable, rinse with lukewarm water (not hot!). After you've removed all traces of the cleanser, dab your face lightly with a towel, allowing it to remain slightly damp. Follow up with a rich moisturizer of your choice. Applying the moisturizer to damp skin will ensure that the water is sealed in, thereby keeping the skin supple and maintaining continuous hydration. The La Roche Posay Hydraphase Hydrating Cleansing Milk can be found in CVS drugstores nationwide, as well as online at the official La Roche Posay Web site.